If you have an iPhone or iPad download the App here. All investment asset classes produce what are called "special situations" from time to time. These are unusual opportunities that are exceptionally attractive and won't last long. In the share market, a company may be a likely take-over target and this could result in a sharp increase in the share price. In real estate, it may be that a rezoning of a property is possible with a potential windfall profit for the owner. There are many such possibilities that occur from time to time. Find out where the NRAS properties are now - Download the NRAS App here to gain insight to the geographic locations, local area initiatives, and infrastructure developments that will influence your long term rental returns as a property investor. 1. Watch short educational videos and find out all the details and the significant benefits of investing in NRAS investment property. 2. Understand the upward pressures driving growth in the areas, creating investment opportunities with NRAS investment properties. 3. Search and find NRAS investment property currently available nationwide. 4. Receive regular updates of nationwide NRAS investment property availability. 5. Request more information on the projected investment returns on any given investment property, based on your personal circumstances. Investing is business. It's about making money. It's not about what you like in your home or what you would buy to live in. Far too many people buy an investment property because they love some aspect of the home which often has nothing to do with anything from a rental perspective. Tax considerations are a very important part of investing in property and most people have no idea of these matters, and often make very expensive mistakes. The list goes on but you get the picture. One of the big advantages of any NRAS property is many of these key considerations are already taken care of because the whole operation is designed for investors by experts. There's a lot more to NRAS but this gives you a good quick introduction. The NRAS program will not last long. It is very definitely a special situation with a time limit. NRAS property is probably as good as it gets. NRAS has been in operation since 2008 and so they've had plenty of time to iron out any bugs. This is a huge project with thousands of homes being built in key locations around Australia. Even if you have no interest yourself or you are perhaps not in a position to take advantage of NRAS, you may know others who are. If so, just 'tell a friend' from within the APP itself. You can recommend and pass on the APP to them by email, SMS, or simply send them this page as a link. 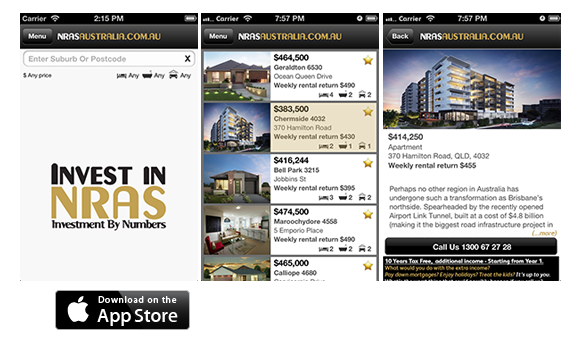 The nras australia android phone, tablet and iphone and ipad app provides information across several investment areas including nras and providing a social impact investment opportunity across a broad spectrum of nras real estate, running across New South Wales (NSW), Queensland (QLD), Western Australia (WA) and South Australia (SA). You can find specifics about individual nras development projects such as nras new south wales,nras qld,nras queensland,nras wa,nras western australia,nras sa,nras south australia, within the NRAS Australia site.